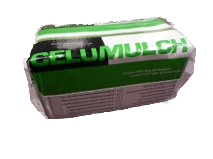 Celumulch™ has a unique blending of fibre size allowing moisture to penetrate into the soil, yet forming a protec­tive coverage for seeds and fertilizer insuring maximum in germination. Celumulch™ is very consistent in fibre and moisture content, and capable of dispersing rapidly in water to form a homogeneous slurry and remains in such state when agitated or mixed with other specified materials. When applied, Celumulch™ is capable of forming an absorptive mat; which will allow moisture to perculate into the underlying soil. Celumulch™ is 100% organic and contains no growth or germination inhibiting factors. Celumulch is a natural wood fibre product manufactured from 100% recycled paper fiber treated with a temporary green colouring agent. Celumulch is packaged in 40 lbs/18.2 kg bags.